If you’re planning a remodeling of your Naples-area home there are certain things you need to do before anyone begins tearing out walls or flooring. You’ll want to do some research and homework so that you have a clear idea of exactly what needs to be done. Blogs (like this one) and sites such as houzz.com are a great help for collecting information. You’ll want to select the right builder for your remodeling project and make sure that whomever you choose is capable and qualified to take on your project. And if you’re thinking about a significant remodeling (and not just a quick “face-lift”) you’ll probably want to select a design-build contractor to make sure things are planned right from the ground up. Then there are the finances to consider. You’ll need to set your budget and decide whether you’re going to pay cash or borrow money for the project. Now you’re ready to move forward and tackle the renovation—right? Not so fast. 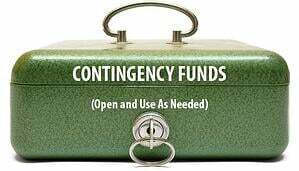 Let’s revisit that last point briefly and talk about something that a lot of homeowners overlook when preparing for the financial side of their project: Having a contingency plan. Even after you’ve selected your contractor and gotten a bid it’s a really good idea to set aside (or add) an additional 15 or 20 percent to the budgeted amount. In our 30 plus years of combined experience with construction in Florida, we’ve seen time and again that unforseen issues and changes crop up on virtually every project. And any remodeling contractor worth his or her hammer and saw will tell you the same thing. Why is that? Either the contractor runs into issues that couldn’t be anticipated ahead of time, or the homeowner wants to make changes to the plan that edge the price up somewhat. Sometimes material costs increase because of shortages. Even a carefully prepared budget can’t cover everything. So before you launch into your project, make sure your budget includes some contigency funds for those surprises. If it doesn’t, you may want to revisit your plans with your builder. You may want to scale back your wish list a bit, consider alternative materials, or perhaps keep existing appliances that still work well and change them out later. Remodeling your Naples-area home is too important to have your plans derailed by enexpected expenses. You can plan for the unexpected so that these surprises don’t spoil your dreams.